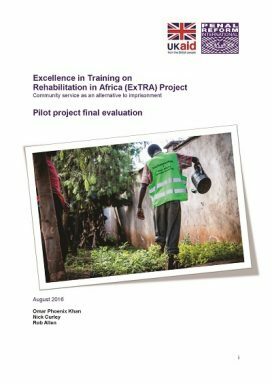 This final evaluation reports on the results achieved and lessons learned in PRI’s two-year ExTRA Project – Excellence in Training on Rehabilitation in Africa which concluded in Summer 2016 and was funded by the UK Government (UKAID). The ExTRA project was a pilot initiative, which focused on developing community service as an alternative to short-term prison sentences for petty offences in three countries – Kenya, Tanzania and Uganda. Read a summary of the evaluation findings.